The Church Town of Gammelstad, Lulea, is the best preserved example of a type of town that was once widespread throughout northern Scandinavia. The cottages served as overnight stop for parishioners who lived too far away to make the journey to the church and back in one day. At the centre of town lies the early 15th century stone Nederlulea church, surrounded by more than 400 wooden houses. These are still privately owned, keeping the custom of a church town alive. The area was colonized by Sweden in the 14th century, it was located in a not well-defined border area with Russia. Priests and taxmen were sent to bring it under Swedish sovereignity. 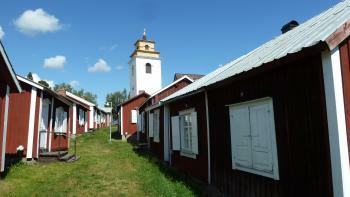 The Church Town of Gammelstad is a village in the woods some 10 km outside of Lulea in North Sweden. It’s hard to imagine nowadays that people used to arrive here by boat. The sea level in the 15th and 16th century, when the town developed, was 10 metres higher than today. By 1649 though, the harbour had become too shallow. Movement of the tectonic plates had caused land elevation. On site you can still see the spot where the old harbour was located: it now is a parking lot for the neighbouring open air museum. When I arrived in Gammelstad on a Sunday morning at 9 a.m. its streets were empty. Only a fat Garfield-like cat welcomed me, and accompanied me on my walk around town. The trademark Falun red wooden houses give the town center a coherent architectural feel, though there are more modern houses on the outskirts of town too. I found the town lay-out remarkable: it seems completely haphazard. The cottages were added gradually and as needed. Once all the streets were lined with houses, the land between the roads was filled by more buildings. They now all lie very close next to or behind each other. At first sight the wooden houses are tiny – of course people did not need much space for just a day in a week here. But not all houses were small: there’s also a more luxurious quarter in town. Here for example lies the mayor’s house. It is also made out of wood and red in colour, but it's a fairly sizeable farm house decorated to impress. The town got busier from 10 a.m. on. Mass in church on Sunday starts at 11 a.m., so the locals were slowly waking up and opening their doors. Also several other tourists showed up, Germans and Chinese among them. A big touring car from Germany even arrived when I left. The town gets 100,000 visitors a year, which isn’t bad for a village. The interior of the big Nederlulea church should not be missed. The church was consecrated in the auspicious year 1492. It has groups of frescoes around the altar, it reportedly is the "northernmost church with medieval frescoes". Other notable ornaments include the baroque pulpit and a 16th century altarpiece from Antwerp. During the Reformation, this area (and this church) turned from Catholic to Protestant around 1590. Despite Gammelstad's cuteness, it will be hard to spend more than 1.5 hours here. I walked the town twice, had a look inside the only house open for visitors, explored the visitor center and had coffee and homemade cake next door at Ullas Café. It’s very much a normal town, the cottages are not taken over by souvenir shops as they would be elsewhere in the world. My final verdict would be: nice enough for a detour, but it would not be part of my Top 200 WHS. I visited this WHS in June 2018. It was a very convenient stop-over before heading further north to the Swedish Lappland. Since I was flying back to Stockholm from nearby Lulea, I decided to revisit on my way back (especially for an extra serving of Tosca Fika from Ullas cafe - thanks Els for the recommendation!). 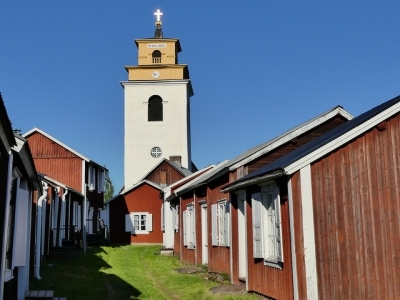 Church towns are essentially a northern feature in Sweden. They were created due to special conditions in this part of the country. There were no sustainable reasons for bigger towns to be built until the latter part of the 17th century. Of Sweden's 71 original church towns, only 16 are left today, the majority of which have been reduced to a remnant. Gammelstad is Sweden's largest (even though still very small; it can be covered in a couple of hours) and best preserved church town with 408 cottages which have never been struck by a major fire. The central influence of the Church was used in economic and in political life with establishments that usually belonged to the town. The church itself, surrounded by the church town and the public buildings, is also inscribed. The Nederlulea (Lower Lulea) church is the largest medieval church in Norrland. It has some late-medieval frescoes, an altar screen which was built in Antwerp, and a very ornate pulpit inside. 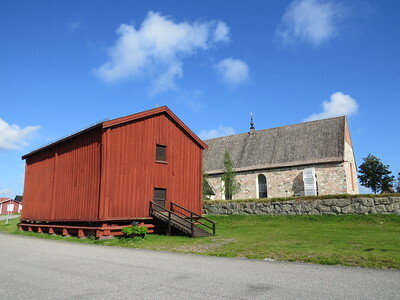 People converged at Gammelstad to attend High Mass and hours of devotion, to attend markets, court sessions and parish meetings, but also to meet friends and acquaintances from other villages. Church weekends gradually became divided into youth weekends and weekends for older people. The church town tradition of spending the night in church cottages in connection with church weekends was a decisive factor for conferring world heritage status as this custom lives on till today. Three to four times a year, youths are invited to a church weekend and during the traditional confirmation classes before the midsummer celebration, they stay in the church cottages and still today some of these 'acquaintances' lead to marraige. In the past, there was a cute tradition of "nocturnal courting sessions". This reminded me of Coimbra's fado in Portugal. Apparently, the boys in town courted the girls through the windows. They used to knock and say something which had to rhyme along these lines: "You're my friend, so I've been told. So let me in, out here's so cold. Let me in, you must believe. Have a heart, lend me your sleeve". Then the girl decided if the boy was allowed to come in for the night and lie next to her. The cottage in 253, Framlanningsvagen, is open to visitors in the summer months and gives you an idea of the cottages' interior. By the door, look out for the UNESCO WH inscription certificate. The upper floor of the small visitor centre is also worth visiting. In front of the visitor centre there's the UNESCO WH plaque. The best time to visit for photography is in the afternoon. All in all, I really enjoyed my time here even though it isn't one of the best WHS on the list. This is an unutterably pretty place to visit, the charming lanes of wooden houses all painted in Falu Red were complemented by a great one room museum explaining the history and importance of the settlement. From the first time I saw a picture of this is a site I always assumed I would visit. My armchair trips always pictured it as a cold, dark and snowy place; as such my visit on a balmy hot, bright sunny summer day had already skewed my conceptions. There are several Church towns around Sweden we managed to visit three of them almost by accident on our loop of northern Sweden, however Gammelstad was by far the largest and most impressive. The higgledy-piggledy clusters and rows of red cottages all wind up hill to the central church which was another delightful surprise. I was fully expecting the usual somber plain interior however it was rather impressive with the ornate altarpiece being the highlight. We then headed to the tourist information office and upstairs to the little museum. In only one room this place did a great job of explaining the history and importance of the settlement, this is the sort of exhibition I wish introduced every world heritage site. We bought some ice creams and walked some more quaint rows of wooden cottages and called in to a community car boot sale (we finally discovered what all those signs for "Loppis" in Sweden were about). Feeling suitably impressed headed off to nearby Luleå for a pleasant wind down at the lovely waterfront cafes. It was really rewarding visit to a place I hand longed to see for several years. The glorious weather, quaint layout, friendly community and excellent explanation made it well worth the trip. Getting to Gammelstad from Smedjegatan in the centre of Lulea is easy on a #9 bus, which stops at Kirkbyn, outside the Gammelstad church. There was a funeral in progress at the church when I arrived, but I got to see inside it later on after visiting some of the tiny red-painted cottages that form the church-town. From "Church Village of Gammelstad, Luleå" to "Church Town of Gammelstad, Luleå"
Gammelstad lies 11km outside of Lulea, and close to its airport (with frequent connections to Stockholm and some other destinations). 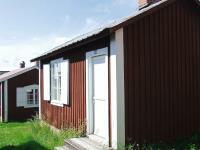 Carl Linnaeus: Carl Linnaeus visited Gammelstad in June 1732 on his Expedition to Lapland. He wrote: "Though summer here be briefer than elsewhere in the world, yet I declare it to be more pleasant. Never in my days have I been in such good health as now." Protestantism: Betel Chapel (now the tourist info) was used by the Baptist congregation around the turn of the 20th century. Name changes: 2014: to change "Village of Gammelstad" into "Town of Gammelstad"